Against all odds, Phil Lord and Christopher Miller’s The Lego Movie reaped massive successes when it was released five years ago. 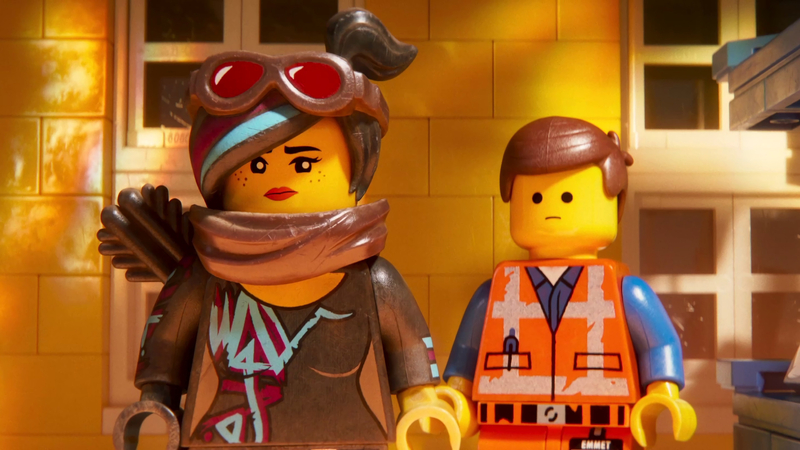 While Mike Mitchell’s The Lego Movie 2 doesn’t quite come close to the unexpected surprises of its predecessor, it does succeed on being the darker, more serious (and therefore more adult) follow-up. The action picks up where we left off. Emmett (Chris Pratt) and friends have saved Bricksburg, only for a hoard of Duplo to arrive and cause further havoc to their once peaceful city. Five years later and Bricksburg has all but been destroyed, reduced to sandy rubble and dubbed “Apocalypseburg”. Emmett retains his sunny disposition, something that doesn’t sit right with Wyldstyle (Elizabeth Banks) considering all that’s been lost. The duo find themselves separated when the Duplo invade once more; Wyldstyle taken to SyStar System for an intergalactic wedding along with some familiar faces (Batman, Princess Unikitty, Benny the Astronaut and more return), while Emmett must rally to save his friends. While the first Lego Movie relished in the childlike wonder and awe of bringing these building blocks to life in such a dazzling – and entirely inventive – way, the sequel slows things down, veering into darker, more adult territory like the brooding middle instalments in trilogies we’ve come to regard as cornerstones (The Empire Strikes Back to name but one). This results in a film that doesn’t have as many laugh-out-loud moments per se, but one that reaches deeper into mature themes. That’s not to say that the endlessly enjoyable pop culture references and cheesy pop songs have disappeared, because they haven’t. Rather than sticking with what’s tried-and-tested, The Lego Movie 2 pushes the boat out into uncharted territory. This extends to the characters too, who each undergo their own evolution – which in itself is quite remarkable for a film with so many supporting players. It doesn’t always work (the film take a while to warm up), but it shows that Mitchell and his team are keen to challenge their audience and not crumble under the pressure of a sequel and deliver exactly the same as what came before. The animation, in turn, is striking. It remains overwhelming to see these lifeless blocks brought to life in such bright and creative fashion. The film is saturated with references to many of Warner Bros’ most successful canonical characters and franchises and the voice work more than matches up, including the workings of newcomers Tiffany Haddish and Stephanie Beatrix. It may not be what everyone expects from a sequel to The Lego Movie, but in some ways that’s the best thing about The Lego Movie 2. It presents something different, wrapped in a familiar outer core. The franchise has stepped up. All we can do now is wait for the big ending.